I think the perfect bag for an under-seat business trip is the Timbuk2 Ram. I’m a big fan of Timbuk2 products. They last and last and last and… well, they are rugged. The Ram is a messenger/computer bag with hidden shoulder straps. 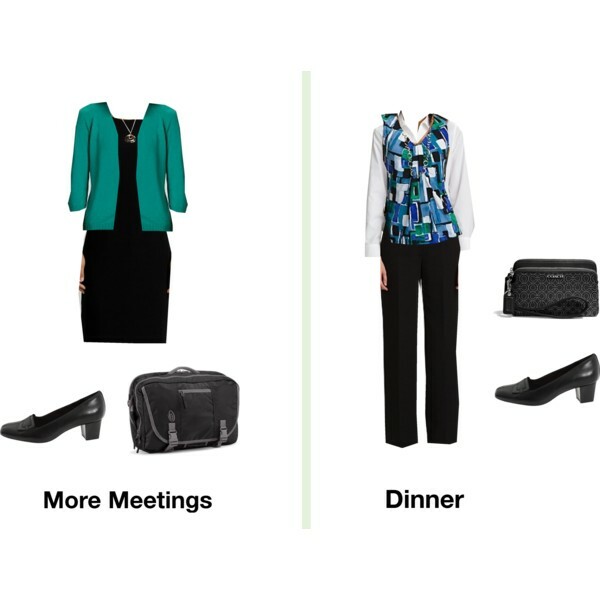 Carry it 3 ways: by the handle, using a shoulder strap, or using the hidden backpack straps. The size is 34.8 linear inches (87 cm) which is within the size range for a personal item. The main compartment zips up to hold all of your clothing and sundries, keeping them private. There are two additional compartments – one for your computer and one for your files/cords. 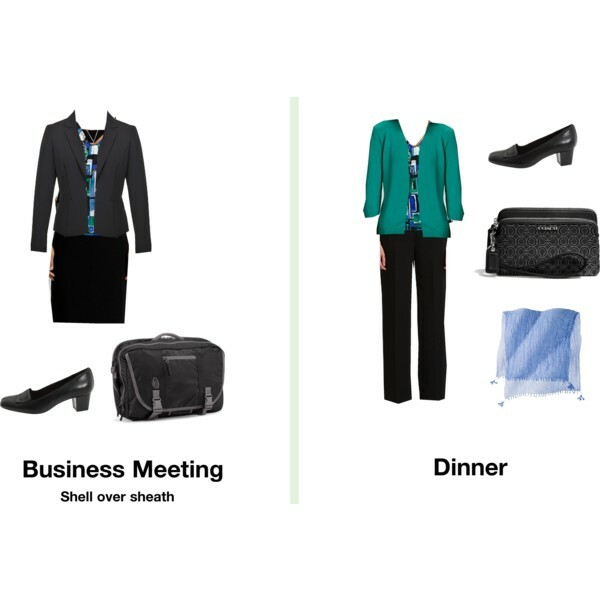 You could go straight from the airport to the business meeting without clearing out your bag. 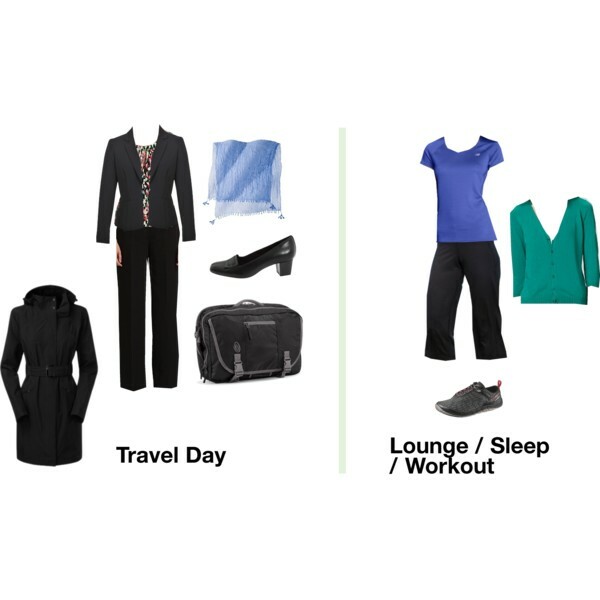 I prefer coordinated suit pieces for multi-day business trips. I like a suit jacket with a sheath dress and a matching pair of pants. 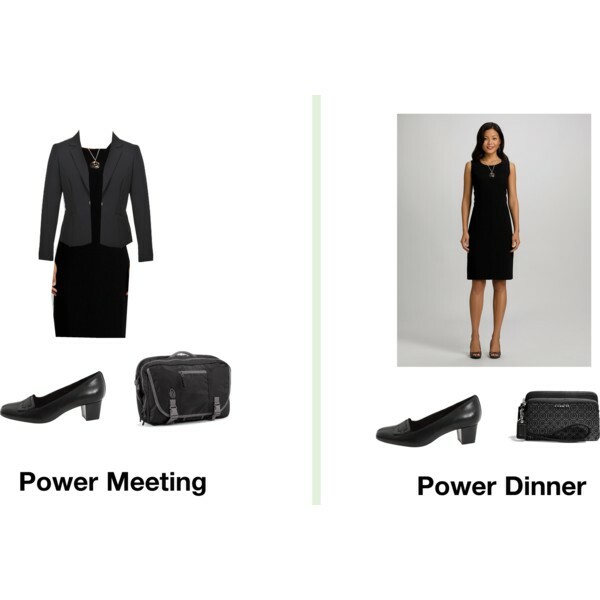 The sheath is suitable for dinner meetings. Add in a few jersey-knit shells and a white shirt and you have several outfits. The dress shoes are geared for standing and walking. I also bring workout clothes that double as sleeping/lounging clothes. I work out in the morning, rinse out my clothes, and hang them up to dry. They are ready to wear for bed time that night. I always bring a light sweater because I get cold easily. Add in a very light packable trench just in case of bad weather. Packing is a little tricky. 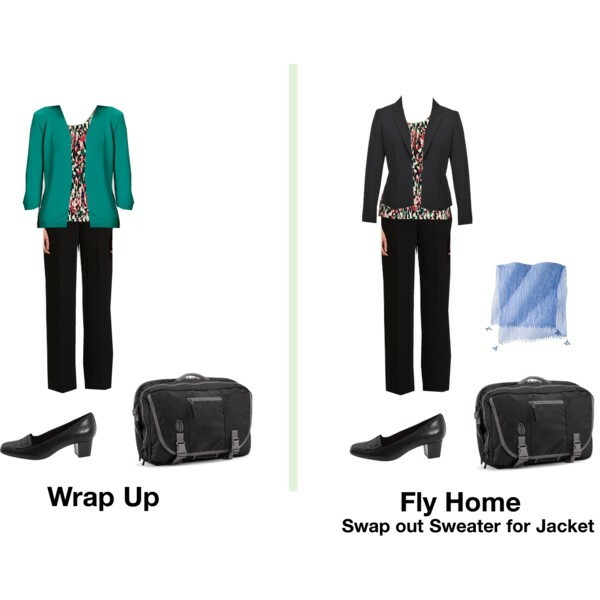 Wear the bulkiest items on the plane to save space. 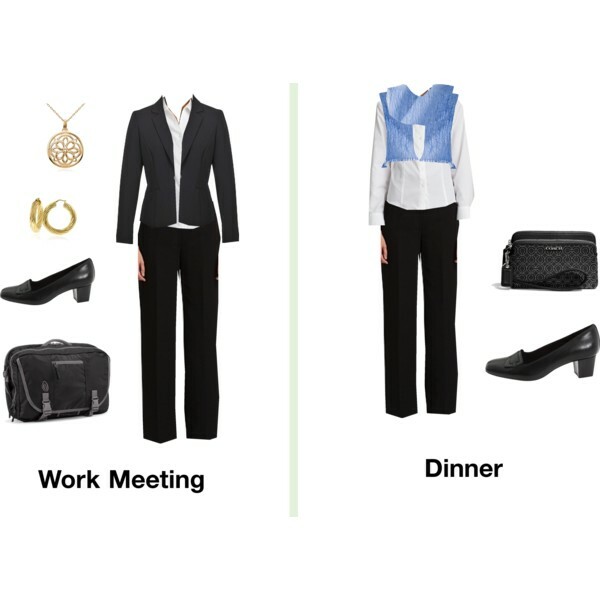 I would wear the suit jacket, the dress pants, a jersey shell and the heels. The rest of the items may be bundle wrapped or rolled to fit into a light packing cube or a zip-lock bag. My toilet kit is very small, and the running flats collapse. Use a wristlet instead of a purse. This provides the same function as a purse but packs very small into the messenger bag. I would also follow other advice Road Warriorette gives, such as using small bags for makeup and other sundries. Stuff these into the corners of the bag. Love this! Those collapsible running flats are pretty neat. Great ideas here and I had to write them all down! Thanks. Very easy to do. Just have mix and match items. Remember…comfort before fashion! Scarfs are the perfect accessory for everything!